Natural gas engine has two series: series 190 with single cylinder, series105 with four or six cylinders. 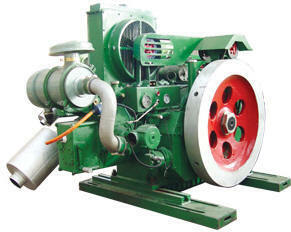 It is a kind of internal combustion engine which uses natural gas, LP-gas and other combustible gas as fuel. 1. Oilfield production, such as direct driving pump units. 2. Pump stands, such as injection pump, gather and delivery pumps etc. 3. Generating stations and engineering machinery which is a kind of ideal unit. 1. The new materials, process and technology are adopted. 2. Start fast, running reliable, easy operation and maintenance. 3. Compact construction, long overhaul, suitable working in bad weather, harsh environment. NEMA D standard high efficiency motors are totally enclosed fan-cooled machine (IP54).This series motors are designed and manufactured in accordance with NEMA standard of U.S. A and C390-93 standard of Canada . These motors are of a novel style and of excellent workmanship. The motors are characterized as reliability safety , minimal temperature rise , high efficiency , low noise , low vibration , high starting torque , etc. The motors adopt design B and class F insulation. Their service factor is 1.15. They are rated 208-230/460V , 460V or 575V and 60Hz.Exposure to an ambient temperature in the range of -15 ? to 40 ? , and to an altitude which dose not exceed 3300 feet. They are ideal for application for driving Beam Pumping Units in field. They can be used to drive various kinds of mechanical equipment. This series motors can be specially manufactured on request , such as T , TC , TD or H insulation class , different voltage , different frequency , etc. Series Y motors are small sized, 3-phase A.C.cage induction motors designed for general purposes. They are totally enclosed and self-cooled with built-in fans. The protection degree of motors is IP44, IP54 or IP55. Note : Frequencies , voltages &. Connections are available for export motors of any special orders. Main parameters and connections are marked on the nameplates of motors and connection diagrams in terminal boxes. PLEASE INQUIRE SHINEQUIP FOR TECHNICAL CATALOGUE.